I’ve gone over more than 10 “How to calculate your net worth” guides, only to realize that none of them really give what people want – a good real-life example. Here is a tutorial on how to calculate your net worth based on my current real life situation. Yes all the “money numbers” in this post are real – they are not made up. Your Net Worth is basically a sum of money that you will have when you sell all your worldly possessions and pay off all your debts. The bigger the number that you get, the better. Calculating your net worth can be a good way to bring you down to earth – it only takes into account the things you have already done in your life and doesn’t take into account the fact that in the future your knowledge and education can be major source of wealth. This keeps things in perspective. When first calculating their net worth most people are startled to find that they are worth a lot less than they thought. The first time I calculated my net worth I was very surprised to find it negative – I had more debt than valuable assets that I could sell. It was a blow to my ego – I had always thought better of myself. Your Net Worth is positive when you can pay off all your debts after selling everything you own. Your Net Worth is negative when your total amount of debt is greater than the total value of the things you own. Why Calculate Personal Net Worth? It is safe to assume that most people calculating their net worth for the first time will find it negative – this is not necessary a bad thing. The goal of calculating your net worth is that it enables you to improve your financial situation. 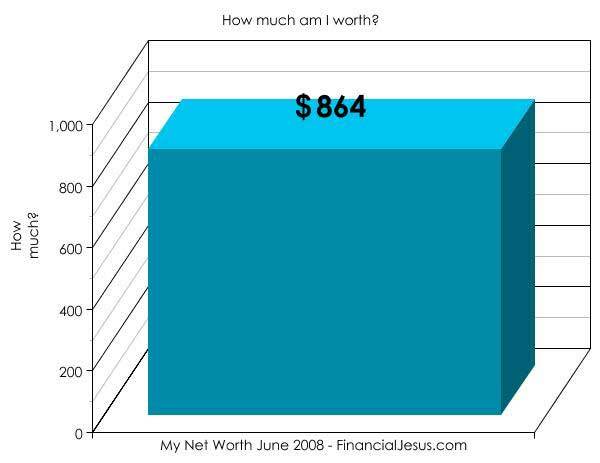 As of June 5th 2008 my net worth is 864 dollars! Why is my Net Worth like it is? As you can see above I don’t like buying expensive stuff and I don’t like borrowing. I only take a loan when there is absolutely no other way. That being said I am not satisfied with my current net value because I feel I should be worth a lot more. But that’s just the emotions talking, not the facts. The facts are that I own very little and at the same time I owe very little. My assets and liabilities pretty much cancel each other out. I am more than certain that there are people reading all this that have a lot more assets but at the same time their total net worth is lower than mine (this means that they also have a lot more debt than I have). Different people calculate their net worth differently. As you can see I have included the things I own all the way down to my digital camera that I estimate to be worth only about 30 dollars. Some people don’t include things that are worth less than 500 or 1000 dollars. It would just end up being too complicated and take too much time to complete. Of course I have things that are more expensive than the things on the list, but I did not include them because they are very difficult to sell. Coming up with the values of your assets can be tricky. I usually take an educated guess – For how much could I sell this in two weeks? Whatever time frame you choose – stick to it with all your assets. You should only consider doing an exception to costly assets like a house or maybe a car. Expensive things take a little longer to sell. If you are not sure about your “educated guess” you should check the local classified ad magazines or the internet for prices of similar things. If you live in the US a good place to start is Craigslist or Ebay. Take care to list everything you own with the prices you could really sell them for. While inflating the price of your house on paper can make your net worth look bigger, there is really no benefit in doing so. It might give you a false sense of security and thus do you more harm when you are suddenly in need of selling your assets. If anything it’s a good idea to list your assets as little cheaper than they really are – that way you can be absolutely sure that you can sell them for the price that you have listed. Should you include the money in your pension plan or a 401K? Yes you should. While this money might not be accessible to you at the moment it is still YOUR money and on some occasions you can use this money to secure a loan. I have a house and a mortgage. Do I need to put both of them on my net worth? Yes. List the price that your house would sell for under assets and the mortgage you still need to pay under liabilities. If the price of your house is less than the mortgage then it means that after selling it you would need to come up with extra money to pay for your home loan. If you take a close look of my net worth above you will see that I did exactly the same thing with my laptop that I recommended you do with a house. I still need to make 316 dollars worth of payments for my laptop (as seen under debt) and I estimate it to be worth about 592 dollars when I would need to sell it right away. That means that after selling my laptop and paying back the debt I would end up with 276 dollars. Why Everyone Should Calculate Their Net Worth? A good reason to start calculating your net worth is to increase your financial situation. By calculating it regularly you will have an overview whether your decisions during the last month made you financially better or worse off. Learning from your own mistakes is the surest way to success. I recommend making the calculating of your net worth a monthly habit. It does magic on making you think about your finances. If you wish to get more real life information about calculating your net worth be sure to sign up to our full feed RSS or subscribe via email. If you have questions regarding how to calculate your net worth, leave them in the comments and I am more than happy to answer them and update this article accordingly. I’ve always been antsy when it comes to calculating my net worth because I know I’ll get a negative result. But I know it’s very important to get a good knowledge of how rich/poor you are so you can improve financial management. This post served as a nudge. Thanks! I am more than happy if this article really gets you to calculate your net worth! How in-depth should people go when calculating this? I currently own a lot of stuff (TVs, Computers, Ham Radio Equipment, etc) and it would take quite a while to determine an accurate value for everything. Good job at being positive, mine would more than likely be negative…however, in your situation, I would use some of the cash on hand to pay off the credit card and computer. If you feel that you have too much things you can only take the things costing upwards of a certain limit – let’s say you include everything more expensive than 500 dollars in your net worth. It shouldn’t take a lot of effort what should cost more and what less. Hmm, as far as I’m aware I neither own anything worth counting or owe anything. My computer is borrowed off someone else, no TV, etc. Am I the only one? ‘Course, I do have about $8000 in the bank, but that’s no fun. Seems like you are keeping it real! Nice post Roman. I always like tracking net worth for motivational purposes.